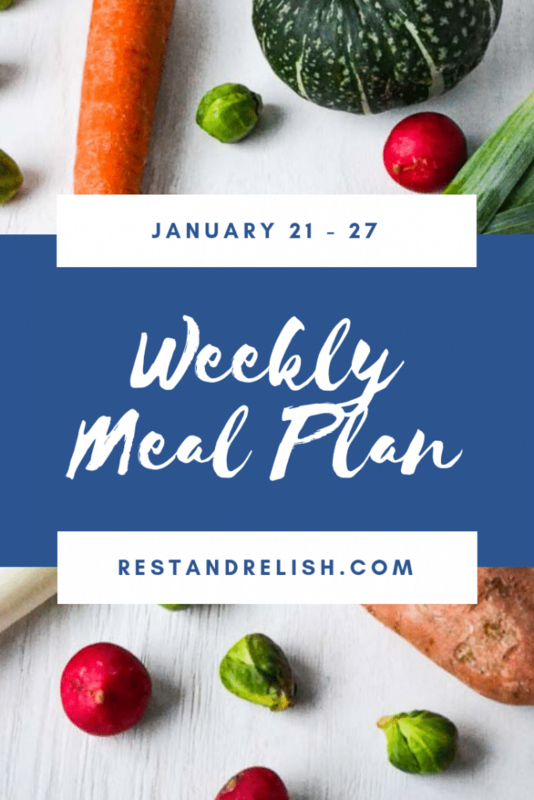 This week’s Rest & Relish Weekly Meal Plan includes two pescatarian and two vegetarian options, a one-pot vegan meal, and a Sunday dinner with meat if desired. Sous Vide Salmon with Roasted Root Vegetables. We try to eat fatty fish twice a week to reap the benefits from omega-3 fatty acids. Omega-3’s are so important for brain and cardiovascular health. We love to sous vide salmon and recommend it as the best way to retain moisture. If you’re interested in purchasing one, we own the Anova 800 W Precision Cooker. Any combination of roasted vegetables will do! If you’d like to follow a specific recipe, check out my Oven Roasted Brussel Sprouts. We love a quick bowl recipe on a busy weeknight. This week we’re trying a new recipe found on Pinterest for a One-Pot Shrimp and Udon Bowl. This recipe comes together in under 20 minutes and is dairy-free too! Bonus anti-inflammatory ingredient= turmeric! I’ll leave the shrimp out for our shellfish-averse dude and add chicken to his bowl. My vegetarian crockpot chili recipe is coming to the blog soon! Your favorite beans and tomatoes, yet I have a few other ingredients that take this recipe to the next level. Stay tuned! Vegetable Fritatta and Green Salad. As I’ve mentioned before, I like to clean the veggie bin toward the end of the week. A vegetarian fritatta is a simple and easy recipe for an end of week dinner. A seasoned cast iron skillet is the best vessel for fritattas. If you don’t have a cast iron skillet, make sure to use an oven-safe skillet. The combination of vegetables and cheeses for fritattas are endless. Just make sure to pre-cook you veggies before adding them to the egg and cheese mixture. Pizza is a frequent Friday night choice for many families, but instead of ordering takeout, try homemade flatbreads. Everyone can make their own individual portion…easy peasy! We plan to have my Rainbow Vegetable Hummus Flatbread recipe. The kids will choose their favorite toppings from the countertop and build their own version of the recipe. Bonus Tip: Make the Classic Hummus Recipe earlier in the week to enjoy for lunches and snacks. Save enough for Friday’s dinner and meal prep is so easy! BBQ, Greens and Deviled Eggs. It’s a traditional Southern Sunday supper with chopped BBQ, sautéed collard greens and my creamy deviled eggs. Vegetarians can forgo the BBQ and double up on deviled eggs for extra protein.